Operation Legacy provides intensive life planning information enabling and assisting our military men and women in the transition to purposeful, productive and meaningful civilian lives. Often, the lack of foundational preparation for civilian life planning strategies sets the stage for a downward spiral including apathy, unemployment, broken relationships, addiction and depression. The Journey began with an alliance of three Principal Founders wanting to make a difference with intensive life planning information enabling our military men and women in the transition to purposeful, productive, and meaningful civilian lives. 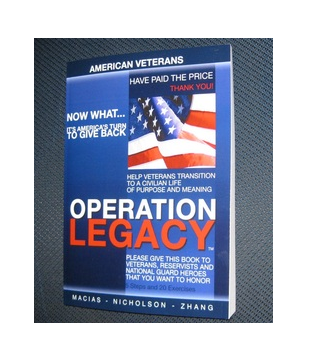 Issues and needs for "Operation Legacy" Workbook: There is a gap between military and civilian life. Lack of foundational preparation in civilian life planning strategies sets the stage for a downward spiral including apathy, unemployment, broken relationships, addiction and depression. Our Vision is to see our military men, women and their families successfully "cross the gap" and transition into civilian life with purpose, passion, focus, and meaning. Our Mission is to provide every Military man, woman and their families with this information, insight and skills to successfully develop their life plan to bridge military life to civilian life.